Another trend I’m loving this Fall is plaid! Throughout history, plaid has evolved and has been worn in so many ways. One of my favorites are my adding punk influences. 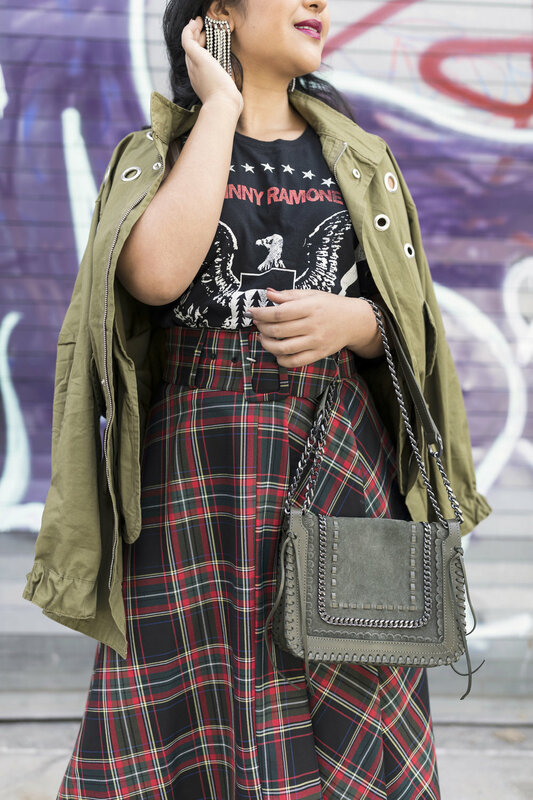 In the 90’s grunge movement, plaid was one of the prints that defined this fashion era. Designer like Vivienne Westwood and Alexander McQueen showcased plaid prints with leather details and heavy metals like grommets and stuff. Plaid wasn’t as proper as it was in the earlier decades. Instead, it had trickled down to the streets. 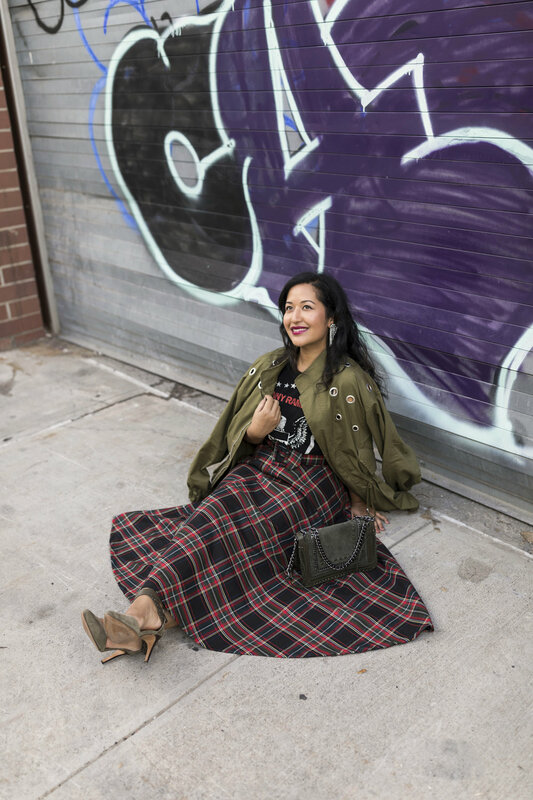 Plaid pants were paired with rock band t-shirts, leather jackets, platform patent leather boots, ripped fishnets, and metal chains. Any of those items sound relevant to today’s trends? Yes, the 90’s are making a comeback too! As you know, my style is pretty feminine but I love to add a little edge once in a while. Rock band/ graphic t-shirts are a favorite fashion piece of mine. I wear them all the time (see other examples here and here) and I felt like it was the perfect shirt to wear with a plaid skirt. It adds the right amount of edge and also helps pull colors from the plaid. Tip: tuck in your shirt and add a white belt to break up the two. Since it is Fall, you’ll need a jacket. I love jackets with grommet and zipper details. Also, olive green is a good transition color into Winter. For accessories, suede fabrics are great in the Autumn. They add a warm while still looking luxurious. Again, olive colored items are unique and versatile. I’ve linked some amazing olive colored bags and shoes for you below. To make the look more feminine, add some sparkle through your jewelry. A girl can never shine too bright!